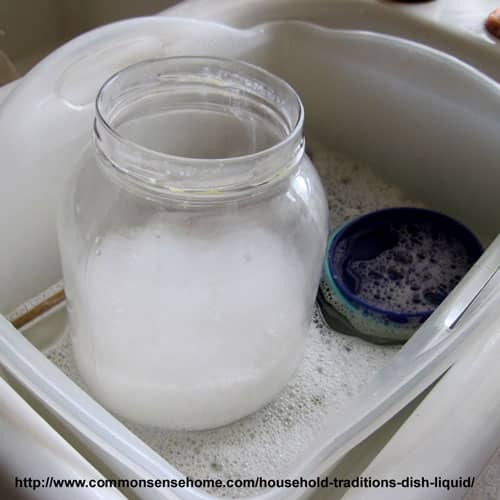 How well does Household Traditions Dish Liquid work? I found the dish liquid to work well at cutting grease and getting off everything my kitchen had to offer. Unlike some natural dish liquids I've tried, it made nice bubbles (see photo below), which stuck around for the whole batch of dishes. I know I don't absolutely *need* bubbles for cleaning, but what can I say – I like them. Also, I encountered something unexpected while washing – my glassware got so clean it squeaked! I washed a gallon jar from milk, and as I was putting it in the dish drainer, I noticed it was squeaking like fresh cheese curds against my hands. I've never had that happen before. I did find it to dry out my hands a little – not as much as some brands, a little more than others. Rub on a bit of lotion bar and I'm good. Plenty of suds in the sink. Why not choose a gentler, safer option? I love TT products. I have never tried this soap, but I’d like to. 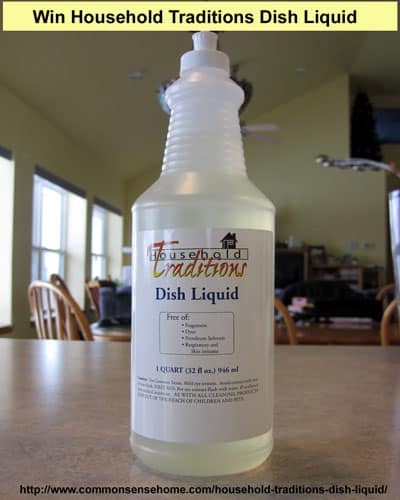 I really want to see how well Household Traditions Dish Liquid works. I hate using so many harsh chemicals on anything my children come in contact with. Can Tropical Traditions brand be found in any stores, or only online? I think they are only online. I’m excited to find out there is a dish soap that doesn’t have harsh chemicals! Thanks for the review!! Love to learn more about this dish soap. I’ve never tried their coconut oil and I would like to learn more about that and try it. I am always looking for healthier more natural products to replace the more traditional stuff on the market. Even if I don’t win, I will try your products out! Thank you for always bringing interesting things to us! I would love to give this a try. I’ve been using Planet dishsoap from the grocery store, which is an improvement over Ivory, but I think this is probably a lot better. I would like to try the Palm Shortening sometime… I sure appreciate your site, learn so many new things! I love Tropical Traditions coconut and coconut oil. I use the oil for frying, baking and making lotions for myself and my family. Just found your site and love it!! I love their products. I would highly recommend them! I didn’t know they had a dish soap so i would like to learn more about that!!!! I didn’t even know they had dish soap. I would love to try this and also the palm shortening. I have used coconut oil for awhile now and would like to also try palm shortening. Thanks for the giveaway. I’d love to know more about the Organic Virgin Coconut Oil Teeth Cleaners. Thanks for the giveaway! I would like to find out more about the Dish Soap, the Massage Oil, and the Toothpaste. I love the Organic Coconut Oil and use it all the time. I Love their Raw Organic Honey. I would like to know more about the Palm Shortening and the Bug Arrest! I would love to try this dish soap. I also like the bubbles, it makes me think the soap is cleaning the dishes. The different healthy fats & oil. I’d like to learn more about their other cleaning products as well. I would like to learn more about their hair care products. I just found your website today and am very excited to trsy any of yur products. They all sound fabulous!I was sad to see you are back ordered on you shampoo bar as I really need some good shampoo. I already like their dish soap. I would like to learn more about palm oil. I use and love so many of their products already (palm shortening, 3 different labels of Coconut Oil, CO pump hand soap, lip balm, toothpaste, cocoa, brown mustard, etc) but still want to try the dish soap and the coconut chips! thank you for the chance to win the dish liquid! I absolutely love Tropical Traditions, but haven’t tried anything but their coconut oil! I’d love to try their meats sometimes, especially their soy-free eggs. I already use lots of the food products so I would like more on beauty and cleaning. I would love to learn more about the non-toxic cleaning products. I would love to know more about their organic maple syrup. Tropical Traditions has the absolute best virgin coconut oil ever! I’d like to try the maple syrup. Hope to win so I can try this detergent. I really like Tropical Traditions products! I buy them regularly, but I have not yet tried their dish soap. Probably any of their cleaning supplies. I already use so many others. I would love to win the dish soap!! Please pick me!! Am a first time custom I would love to win your free dish soap!!! I already love and use your coconut oil, coconut flour & your unscented lotion ( best lotion ever!). I would love to try your dish soap. Which Tropical Traditions product would I like to learn more about? I am curious about your Palm oil and how it differs from the palm oil in regions by the tropical rain forests? I’d like to learn more about the raw honey. I would love to learn more about TT tooth cleaners.